Skeletal – visil prosthesis are basically made from metal alloy, while the rest of prosthesis, which replaces lost teeth, is made of acrylic. 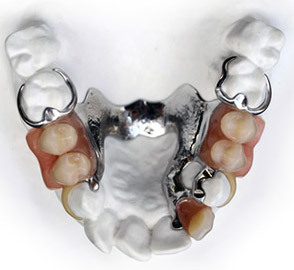 It means that teeth which are made from acrylics are settled on metal construction. This kind of prosthesis are one of those mobile ones. It take much less place in mouth, and adapting to them is much easier. Visil denture last much longer than those which are made from acrylic only, but are more expensive because more metal is used to make them. They are usually recommended in cases when lateral teeth on one or both sides are missing, as a replacement for tooth bridges, or when losing many teeth at once. Allergy on alloy of mixed metals from which are those dentistry are made is very rare. Whom are skeletal dentistry is recommended for? This dentistry is suitable for all ages. Our dentists, after checking your state of teeth, will almost certainly recommend which is right dental implant just for you, or if you need this kind that is described here. What are advantages of visil prosthesis? They take much less place in mouth than any other, therefor, adaptation on them is much easier. Instead of acrylic skeleton is made of metal. Less pressure on upper oral cavity, makes this kind of dentistry makes it much more comfortable. They are much more durable in compare with acrylic, and any kind of damages are very rare. Function of chewing is improved, and by that, power of bite is uniformly spaced with every next bite. Better chewed food facilitates digestion, and simple better bite will make your abdominal problems disappear, or at least make them much easier to take. After the first period of getting used to prosthesis, function of speech follows very fast after that. Aesthetic advantages are more visible than you can get used to it fast enough, this dentistry fills spacing between the teeth which are missing, and the biggest advantage is that they are so much alike your own teeth , you can hardly see the difference. Using visil prosthesis, the face itself looks more filled, and it looks less warned-out. Without it, face looses support, and skin muscles loosen up, in paces where teeth once were, and after a while , face starts to look drained and tired. But, by using this prosthesis, the face looks radiant, and filled in places it should be full.